1.MoriX Card does not need to record the fingerprint image. 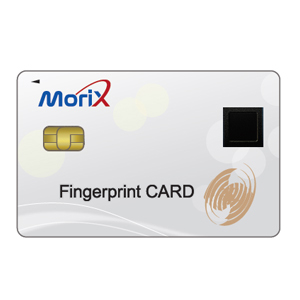 2.MoriX Card will be activated only after successful fingerprint authentication. Newly developed ultra-thin,low power consumption forcard applications. * Optional liveness detectionis available. User interface for guiding fingerprint matching procedure and displaying results. Battery may be included per customization. *Batterylifetime is 5 years fordisplayingOTP10 times/day. Propriety fingerprint authentication algorithm takes less than 1 sec to complete authentication. Available for general customization such as OTP display. Advancing Morix Card, Morix has also developed a smart card “Morix Card NFC” that implements a contact and contactless smart card with the built-in NFC function for contactless communication. With a built-in thin battery, we complete commercialization of “Morix Card NFC”.